To use your Web Mobile Service just direct your tablet or smart phone, to www.astrologysoftware.com/astroservice/ and login. Natal chart wheel and interpretation so you can see at a glance what is happening at any given time. Your events are arranged and interpreted chronologically and each event includes date and time, keywords, astrological indicator, and an astro-tarot card. Natal Chart wheel plus a detailed interpretative report of what the planets reveal about your natural personality and qualities. The report lists all the zodiac positions of your natal planets, in both zodiac signs and astrological houses, plus aspects between all planetary pairs. 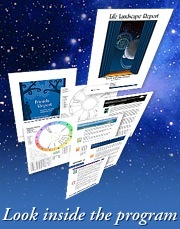 A Natal Chart wheel with a mini-report for today or you can enter your birth data for a personal reading. You can choose five different wheel styles: Standard, Unequal, Euro, Aries, and Helio. A compatibility and relationship report, how the two of you approach the relationships, the role you tend to take on when relating to others. Are You a Yea or Naysayer? This is the first chakra-related report based on sound astrological and astronomical techniques, the actual skeleton structure of the solar system itself. Many people end up working at a job that they did not actually choose and for which they might not be that well suited for or that will not make them happy. This report is designed to put you in touch with your own basic or core abilities, and to sketch out an approach to work that is natural for you. The StarType Life Strategy report provides in-depth details on your natal StarType. Based on your talents and needs, a strategy is outlined based on making the most of your talents and filling in the blank spots of your needs. Moon Interpretation for the day. Runes is an ancient oracle (a divination method) similar to the I-Ching and the Tarot. There are seven spreads or layouts of runes to pick from when asking your question. Each spread is best for different kinds of questions. For example, you can pick one spread for "What if?" questions, and another for "Yes/No" questions. The Runes oracle answers questions according to the specific runes returned and their placement in the spread. For over five thousand years, the Chinese I-Ching, or Book of Changes, has survived as a divination system applicable to cultures the world around. This Oracle I-Ching program uses the traditional hexagram technique where the "casting" of a moment equates to two trigrams which, combined, have an established interpretation, or meaning. Each hexagram contains an "Image" and "Judgment," unique to that hexagram. Hexagrams can be presented in seven color choices. The Tarot used as an oracle allows one to ask a question, deal the cards in a certain way, and extract an answer from the images and symbols. Answers to all of your work, life and romance questions could be waiting for you. Tarot allows you to ask a question, deal the cards in a certain way, and infer an answer from the images and symbols. Spreads included are: One Card, Three Cards, Psychological, Celtic Cross, Zodiac Spread, Karmic Spread, Spiritual Guidance, Work/Career, Horseshoe Spread, Wish Spread, Year Ahead, Radiant Heart, and Romance. Plus you can even choose from 6 popular decks. Registration is free! Join Now. All new members will receive 60 days of free access to our exclusive services as well as a $30 credit to use for purchasing reports!